There are women you can instantly imagine sitting down and having a genuine heart to heart with. 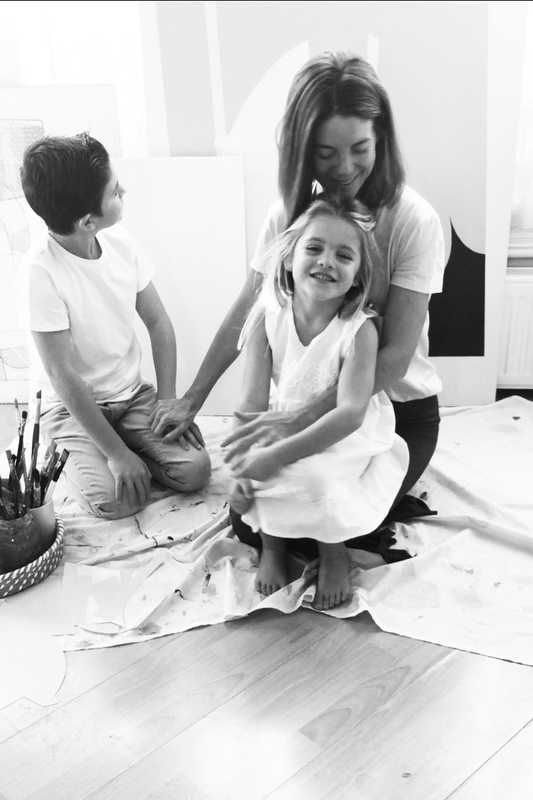 Johanna Rossi is one of them - an artist now living in Monaco with her two kids, open about constantly seeking and finding her footing in parenting and creativity at any given time. That openness has allowed her to build a community locally and online when her village was initially lacking. Below, Johanna offers a whole different perspective to “authenticity” in her evolution, parenting journey and goals and art. Everything changed, yet over the course of the last 10 years everything has become so much more familiar. When I became a mother my son taught me in his unique way just how uncomfortable I was in my own skin and the life that I had created for myself. Events in early motherhood taught me that I could make intentional choices, choices that could lead me away from that discomfort and into a life that I could lead with much more ease. This is something I’m still learning about constantly. I’m still very much in search of finding that place of ease, but also learning ‘to be’ where I am, without feeling like I have to rush to find ‘a better place/time’. I know now that wherever I am, I’m there because I have something to learn. That it will help me move forward. I’m still very much in this process of figuring it all out! Learning who I am, what makes me feel uncomfortable, what makes me feel more like me. I’m not sure I did. My introduction to motherhood was extremely painful physically and mentally, so turbulent and it’s something I’m still trying to process and heal from as my children and I grow in our own rights and together. I wasn’t prepared for motherhood. I wasn’t prepared for the dramatic shift it would make in my life, and how it would destabilise life as I knew it. Becoming a mother was like having the carpet swept from underneath my feet. When I had my son I wasn't painting, my husband and I owned a restaurant and we naturally fell into a pattern of me staying at home with our son and working on the back office and him going to work at the restaurant. As my son got a bit older I would then do some shifts in the evening, but this took it's toll on me physically. I found myself at home alone with our son for long periods of time and it was then that I started to feel the pull towards something that had been missing in my life and I went onto start a journey that would lead me back to my brushes that I had put down almost 20 years previously. Unfortunately any work that I did do would happen when my son slept so that left little time for me to rest or find balance, looking back if I could change anything it would really be to sit with my choices a little longer and to make sure I was putting my energy into the right things a little earlier than I did, nothing I have learnt so far has gone to waste, but I did take a big hit physically. I’m very hard on myself. I doubt myself as a mother a lot. My choices, my actions and reactions. I do know, though, that I have put everything into motherhood and into my growth as a person. I’d like to be the kind of mother that my children actually need, not the kind of mother that I think they need. I would also like to be the kind of mother that my children will feel that they can connect and resonate with as they grow into adults themselves. Taking care of myself is something I have always struggled with, even before I had children. As I mentioned before, my adventures into motherhood have been filled with such strong emotions that have brought a shift throughout my whole being. It made me very sick and forced me to reevaluate everything about myself, my place in this world, and my choices. I have had little outer support as a mother, and my children have been terrible sleepers, so my self care has been founded around the basics of holistic medicine. Mainly food to support my digestive system, which supports the body as a whole and my journey to connecting back to my art. Loving myself enough through such a hard journey to go in search of what makes me whole. As I mentioned, I’ve made no secret that my life has been very unbalanced in many ways. At times I have found motherhood and this journey terribly lonely. I built my village by being open about these feelings and making real connections with a handful of wonderful creative women here in Monaco and a number of women online who resonated with my message. I don’t believe it is the amount of time you spend with a person that builds a relationship. It is the quality of exchange, the ability to resonate with each other, and the freedom to fully show up in that relationship feeling like you can speak your truth. So many things. I’ve been an intentional woman in progress for many years now and know that this is a lifetime commitment. Recently, I’ve been strongly pulled to go inward once again and explore my creative process and break through blocks that keep me from showing up as my full self in my art. After all, this is the way I communicate with the world. I am then able to feel more comfortable in my own skin, knowing I’m showing up authentically, and thus able to feel like I am teaching my children they are free do to the same.